As I write this article, 2011 is drawing to a close, the morning frost turns the brown hills to a faint white and we get a chance to think about the great sailing season that ended. ( Yes, even in SoCal, the mornings can be surprisingly cold as soon as you step over the hills away from the ocean!). The year opened up with the launch of the new web site for Coronado15.org. 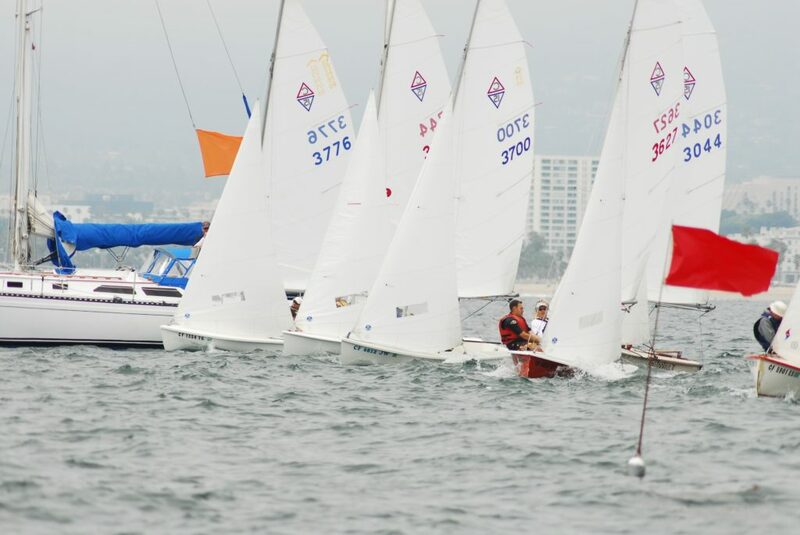 The sailing season started quickly with the super bowl regatta hosted by the Santa Monica Windjammers YC. But when May arrived, we had the Sunstroke series which races in the Marina Del Rey channel every Thursday night. This year was very well attended as we had a few nights with 5 to 6 boats, but most nights had 3-4 C15, which was significantly better than years past. The sponsorship from DISC the local sports medicine clinic and the steady hand of Bruce Fleck as our regular PRO, greatly contributed to that success. But there is more to it than that! Starting with the 2010 NAC that took place in Marina del Rey, I placed a few phone calls to the Long Beach sailors to spark their interest. That is when I came across a boat that was for sale. Concerned that this boat might be snatched by Charlie Quest to add to the Half Moon Bay C15 armada, I decided to buy the boat and sweet talk my son Tom to sail it with his friend Joe. Not only did they have fun racing for three days, they managed with zero practice to beat me by one point overall. That was a humbling moment, but also the sign of good days ahead with the increased participation from SCCYC boats. This boat through 2011 played the role of a club boat by letting various interested parties race it and discover its unassuming qualities: performance, ease of handling and fun. When 2011 started, the Marina Del Rey fleet was fairly spread out and the competition rather minimal. It was fun but it started getting even more fun when, in the course of the season, the fleet started coming together with close finishes. The Thursday night dinners following the races were a great display of the growing camaraderie in the fleet. By far, the most improved sailor of 2011 is John Richardson.. John got a chance to spend more time at the tiller and gained a lot of confidence. Now, with encouragements from his crew Mark Brazil, John is looking at the boats behind him, not in front anymore.Â As a matter of fact, during the Turkey day regatta at ABYC, John was consistently faster and I could not seem to be able to keep in front of him. During the last downwind leg for the day, while I was slightly ahead, John was able to creep up on me and eventually pass me. Then to regain control, I attempted to get him to foul me, but in so doing, as I was asking for room from my leeward position, I ended up tangling my whisker pole on his boom. As my crew Vadim jumped to untangle the boats, our boat immediately flipped before I could do anything. We had a good laugh, which naturally cost us the race but we were wet and cold! With so many chances to sail in 2011, my second boat exposed many people to the C15 and the local fleet. Three club members have decided to buy a C15:. Karyn Jones, our 2012 SCCYC commodore bought my second boat, Nick Sampson bought the 2011 champion boat from Dave Rumbaugh, and Noah Farrell bought another C15. We are also seeing interest from SMWYC with 2 additional C15s that may race during the summer. The 2012 NAC will again take place in Marina Del Rey at SCCYC during the One Design weekend (July 20-22). We are hoping that by the summer the Marina Del Rey fleet will be quite competitive and entice our friends from around the state and beyond to join us for 3 days of great racing on the ocean. Keep an eye on the web site for up to date information. See you on the water!